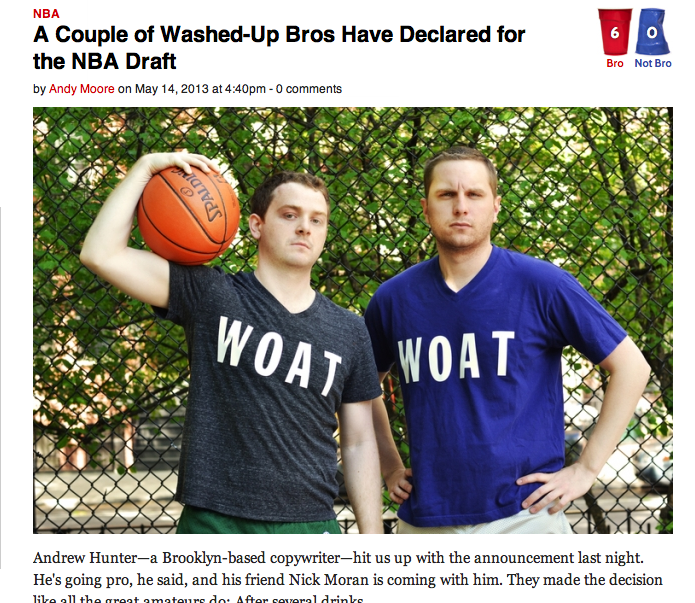 AOL/Huff Po: "This Guy Is Our Hero"
AOL/Huff Po #2: "Drinking Buddies Declare Eligible for NBA Draft, Receive Response from League"
Barstool Sports: "NBA Draft Letter"
BroBible: "A Couple of Washed-Up Bros Have Declared for the NBA Draft"
Business Insider: "NBA Sends Letter to Guy Who Declared for NBA Draft"
CBS Sports: "Random Dude Announces Eligibility for NBA Draft 'After a Few Drinks.'" Complex: "A Reddit User Who Tried to Declare for NBA Draft Receives a Funny Response from the League." Examiner: "Fan Declares NBA Draft Intentions"
Fox Sports: "Drunk Fan Declares for NBA Draft? League Answers in Letter"
Hollywood Gossip: "Fan Declares for NBA Draft, Is Deemed Free Agent by the League"
NESN: "Fan Declares for NBA Draft, League Responds That He Has Officially Been A Free Agent For Years"
Sports Illustrated: "This Is What Happens When Ordinary Citizens Try to Declare for the NBA Draft"
SportsPickle: "The NBA Responded to a Drunk Guy Who Declared for the NBA Draft"
Tireball: "Drunk Fan Declares for NBA Draft, Becomes Free Agent"
With Leather: "Two Friends Declared For The NBA Draft, Actually Received A Response"
Yahoo Sports (Canada): "NBA Fan Declares for Draft 'After a Few Drinks'"